The United States Government is within 5 days of being shutdown by the extremist, Tea Party faction of the Republican controlled House of Representatives. Please visit my politics blog if you are interested in following this story. 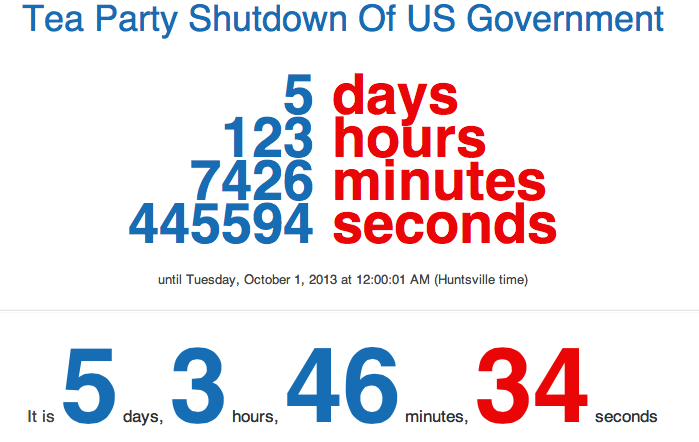 You will find a link to my countdown timer itself so you can watch it countdown in realtime. If you want to understand more about one of the key figures behind the Tea Party efforts to shutdown the government take a look at the following great article from The Guardian. Look George, you gonna be whupped all through the courts. And when you’re whupped in the courts, the Klan’s gonna come out on the streets and the killing’s gonna start. You know what’s gonna happen. Wallace knew Flowers was right. He just didn’t care. His currency with his constituency did not come from winning, or even fighting, per se. His aim was to perform resistance in such a manner that nobody could say he hadn’t tried – even if he had no chance of winning. Damnit, send the Justice Department word, I ain’t compromising with anybody. I’m gonna make ’em bring troops to this state. It had been little more than a ceremony of futility. And, as a historical moment, a rather pedestrian production. But no other southern governor had managed to strike even that dramatic a pose of defiance and it has never been required of southern popular heroes that they be successful. Indeed, southerners tend to love their heroes more for their losses. Ted Cruz’s filibuster to prevent the implementation of Obamacare with the threat of shutting down the government has all the hallmarks of the “noble defeat” of southern Democrats from the mid-sixties onward. He is not so much opposing healthcare reform as protesting its inevitability. Lest there be any confusion, I am not arguing Cruz is in any way a supporter of segregation or admirer of the late Wallace in his darker days. The comparison relates to his strategy, not his specific intent. 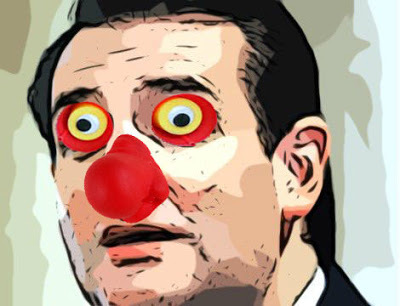 It is in Cruz’s buffoonery, showmanship and tactical disingenuousness that he poses now as Wallace in drag. It is telling that the record for the longest filibuster in US history up this point goes to the late Senator Strom Thurmond from South Carolina, who was opposing civil rights legislation. As Cruz took to the Senate floor Tuesday, vowing to speak “until I am no longer able to stand”, it was clear that efforts to block the healthcare reform were fruitless. The Democrats are the majority in the Senate. Even the filibuster is pointless because procedures exist that were bound to force Cruz to yield the floor by Wednesday afternoon. We’re in the minority [in the Senate]. We have to find a way of standing up for our principles without immolating ourselves in front of everybody, in a way, when we don’t have the votes to do it. But there stood Cruz, backed by his hardline tea party colleagues, going down in flames and lighting the path towards legislative irrelevancy, while reading Green Eggs and Ham and talking about Ashton Kutcher for as long as his voice and legs would hold. A great many Texans, a great many Americans feel they do not have a voice, and so I hope to play some very small role in providing the voice. With victory would come responsibility. He would actually need a plan for what to do about healthcare – as the senator for a state where 33% of adults and 17% of children have no health insurance. Not for the first time with the Tea Party, there is no plan B. Oppositionist by instinct and obstructionist by intent, their aim, from the debt ceiling to the budget, has always been to block and bluster. As such, Cruz comes by his intransigence honestly. As with Wallace, one might even argue that even if it makes no sense legislatively, it does makes sense for him politically. Cruz has eyes on the 2016 presidential race when he will be standing in a party in which, according to a recent Gallup poll, people are evenly split on whether compromise is a good thing. Cruz will be seeking support from the wing of his party (the Tea Party) that is far more likely to champion the notion that a politician should “stick to his beliefs”, than average Republicans are. Cruz didn’t come to the Senate to legislate – which demands compromise – but to perform. Now, he’s turning Congress into his circus.